Vampire Beauties: Vampiress Review: "Jesus Christ Vampire Hunter"
Vampiress Review: "Jesus Christ Vampire Hunter"
The Gist: Jesus is resurrected to save lesbians from vampires. Clarification: If Troma puts it's seal of approval on it, you know it's going to be good. Hold on, this wasn't a Troma film? Like someone purposely decided to make a film that could be mistaken as a Troma vampire film even though Troma vampire films are awful? Well whatever works. The biggest mind blowing fact about this film is that it states on wikipedia that the budget here was $100,000. Obviously none of it went toward the actual production value of the film so I'm guessing this is just actor salary and location permits maybe? 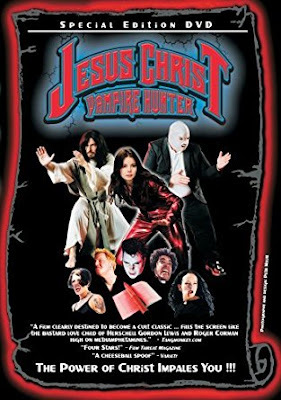 Anyway vampires are attacking and turning lesbians, Jesus Christ is sent to save them with his vampire hunting and martial arts skills, he gets help from various religious themed side characters and an overweight interpretation of Lucha Libre action hero El Santo. Oh and did I mention that this film has musical numbers in it too? Female Vampire Factor: Well considering the lesbian vampire theme there are quite a few of them. Only one gets any real screen time. Otherwise the rest are just eventual stake fodder for the fight scenes. Basically this is if the movie John Carpenters Vampires was a rock opera like Jesus Christ Superstar. I give it a Vampire Beauty Rating of 2 out of 5. Not something I can recommend as a must see but it does apparently have a cult following so some people are into it.